Daily Mysore Style Ashtanga Yoga Classes - All Levels Welcome. Although these are group classes, students do receive one-on-one adjustments and modifications. Two classes per day, morning and afternoon / evening. Seven days a week, moon days excluded. Private classes with an Authorized Ashtanga Level 2 Teacher. Perfect for those who are new to Yoga, those who prefer the setting of a private class and those who wish to deepen their practice with a qualified teacher. One month of unlimited Yoga classes with no commitment . Attend daily and unlimited classes. MOST POPULAR! By far our most loved option. Attend daily and unlimited classes. Three month commitment. 30 Days notice to cancel. Perfect for travelling Yogis who are just in town for a week. Attend daily and unlimited classes. MOST POPULAR! By far our most loved option. Attend daily and unlimited classes. Three month commitment. Chris van der Merwe is an Authorized Level 2 Ashtanga Yoga Teacher from the KPJAYI (Krishna Pattabhi Jois Ashtanga Yoga Institute) in Mysore, India. Ashtanga Yoga Republic in Pacific Beach, San Diego offers daily Mysore Style Ashtanga Yoga classes in the mornings and afternoons. Ashtanga Yoga is perfect for Beginners, Advanced students and Everyone in between. This is because each person in the class practices according to their own level and pace. Chris has been teaching Ashtanga Yoga in San Diego since 2008 and makes regular trips to continue studying with Paramaguru Sharath Jois at the KPJAYI in Mysore. In addition to being authorized by the KPJAYI as an Ashtanga Yoga Teacher, Chris also holds both E-RYT 200 and E-RYT 500 Hour Certifications from Yoga Alliance. People from all over the world practice and benfit from Ashtanga Yoga. It is the perfect form of yoga for both Beginner students and Advanced students due to the fact that every student in the class practices at their own pace and learns the yoga postures which are most appropriate for them. Tirumalai Krishnamacharya was responsible for the spread of the practice of Vinyasa and Ashtanga Yoga in the modern age after he was trained for 7 years in the caves of the Himalayas in India by his teacher, Yogeshwara Ramamohana Brahmachari. At the end of Krishnamacharya's training, a young boy named Krishna Pattabhi Jois became his student and Krishnamacharya passed on the knowledge of the practice to him. 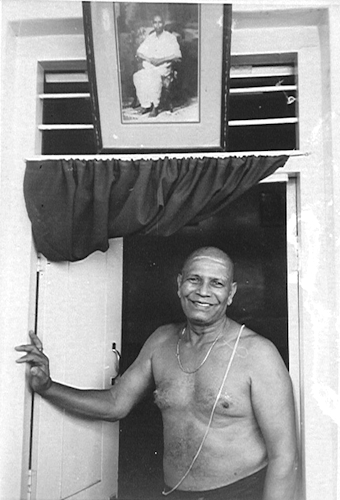 At the completion of his training, Sri K Pattabhi Jois moved to Mysore and began teaching the practice he had learned. At first, Jois recalls that there was little interest in his teachings and it seemed liked the power of this yoga practice might fall into obscurity again. But soon students from all over the world began to hear of the power of the practice, and the practice spread to countries all over the world. 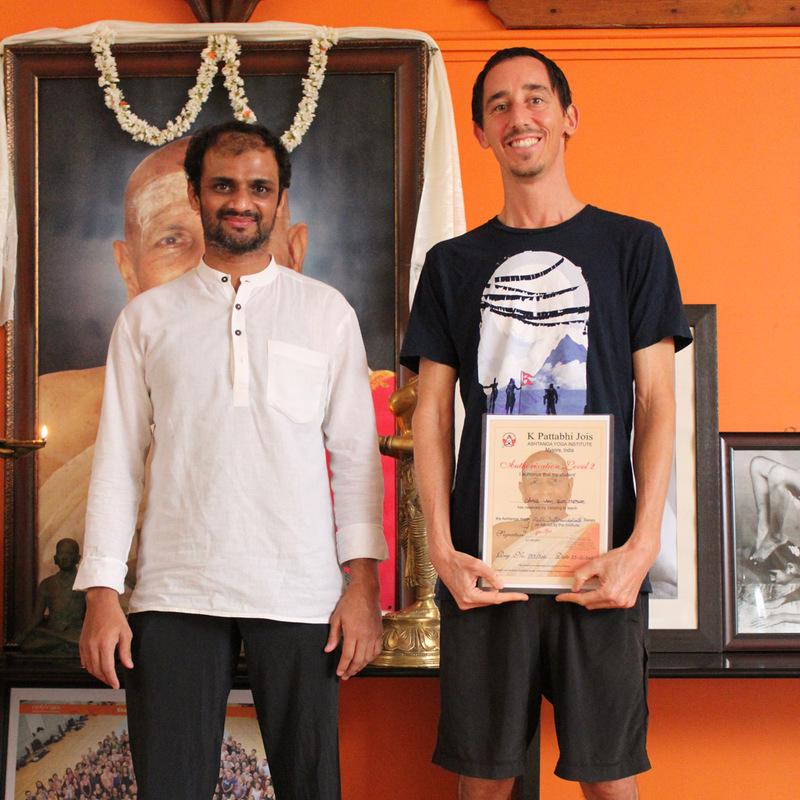 Jois' grandson, Sharath Jois, was trained from a young age to be his successor. Paramaguru Sharath Jois still teaches to this day, the practice of Ashtanga Yoga passed on to him by Sri K Pattabhi Jois at the KPJ Ashtanga Yoga Institute in India. MOST POPULAR! Four Private Yoga Classes with an Authorized Level 2 Ashanga Yoga Teacher. The perfect way to get started learning Ashtanga yoga, worth through an injury or take your practice to the next level. In the practice of Ashtanga Yoga, each month's Full and New Moon days are rest days. Please note that in observance of this tradition, Ashtanga Yoga Republic is closed on the Moon Days shown above.